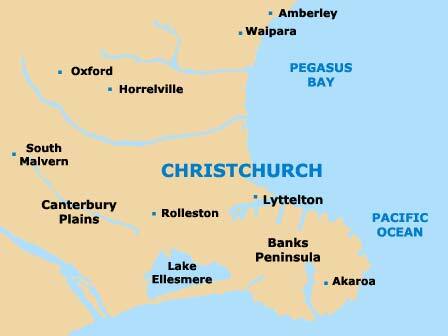 The Christchurch and Canterbury areas of New Zealand's South Island feature a large number of superb vineyards, wineries, breweries and hopfields, with many vineyards situated within easy reach of Christchurch city centre. Famous throughout Canterbury and the South Island of New Zealand, these Christchurch vineyards and wineries produce a host of different leading wines, many of which have won prestigious Air New Zealand wine medals and Le Monde Selection wine awards. Some of the most popular wines produced at Christchurch's numerous vineyards and wineries include Cabernet Sauvignon, Chardonnay, Gewürztraminer wines, Pinot Blanc, Pinot Noir, Pinotage, Riesling, Sauvignon Blanc, Semillon and a selection of sparkling wines. Christchurch's vineyards, wineries and breweries are also highly regarded in New Zealand for their rich fruity ports and local beers, including the Canterbury Draught beer. Many of the vineyards and wineries located around Christchurch and Canterbury are extremely historic, being established more than 150 years ago. Christchurch vineyards export their award-winning wines to many different countries around the globe, including much of Europe. Wine tasting at Christchurch's vineyards is extremely popular and a number of Christchurch wineries now run courses about all aspects of wine appreciation. 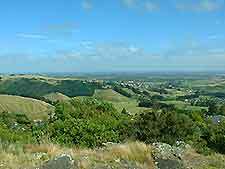 Vineyards, wineries and breweries in the Christchurch and Canterbury area of New Zealand's South Island can usually be found in scenic spots, with magnificent views of the surrounding countryside. Christchurch's vineyards are both large and small, and are particularly concentrated in the Waipara Valley in north Canterbury, widely considered to be the wine-growing capital of Christchurch and Canterbury. Many other vineyards in and around Christchurch can also be found in Akaroa, the Canterbury Plains, the spectacular Banks Peninsula, West Melton, Burnham, Rolleston - south of Christchurch, Halswell, Amberley, St. Albans, Sandyknolls, West Melton, Weedons, Rakaia and areas close to the Waimakariri River. The top vineyards and wineries close to central Christchurch include French Farm Winery, Rossendale Winery and Pegasus Bay Vineyards. Guided tours provide one of the best ways to travel to the most popular wineries and vineyards in Christchurch's surrounding districts of Canterbury and other nearby areas of New Zealand's South Island. An increasing number of Christchurch's vineyards also now feature good restaurants, scenic picnic areas, barbecue facilities, wine-tasting festivals and some vineyards even provide a basic level of accommodation.